Recommended Name: � the Austrian Tarock Type C.
This pattern was originally classified as FT-2.3. Usually referred to as "Austrian Tarock" or "Industrie und Glück Tarock", as are, also, FT-2.l and FT-2.2. It is recommended that this pattern shall be referred to as "Austrian Tarock Type C". This pattern seems to have emerged rather later than FT-2.l and FT-2.2, probably around 1890, the date found on the reins of the cavalier of Clubs in a pack made by Ferd. Piatnik of Vienna and designed by J. Neumayer. (This inscription is retained in many packs made much later). The pattern may have been introduced into Czechoslovakia by Piatnik when they amalgamated with Ritter of Prague after World War I. However, the date 1920 (3 years previous) appears on the saddle of the cavalier of Clubs from packs made by Ceská Grafická Unie of Prague. The pack does not appear ever to have been made in Hungary. It is still made in Vienna and Prague. Some of the scenes are copied from 19th-century packs by Glanz of Vienna (which followed the style but not the order of any of this series of patterns) and a few came from the Steiger pack (see FT-2.l). As with other patterns in this series, the legend on Trump II varies. In Austria it remains constant, with a crowned eagle and "Industrie und Glück". When Bohemia became part of the republic of Czechoslovakia after World War I Ritter (with Piatnik) erased the words but retained the eagle and after World War II the nationalised Obchodní Tiskárny of Prague retained this feature. Between the wars, however, Ceská Grafická Unie had replaced the eagle with a bareheaded falcon and changed the inscription to Audaces Fortuna Juvat. A Piatnik pack of c.1900 showed an imperial eagle with two heads. Usually 54 cards. 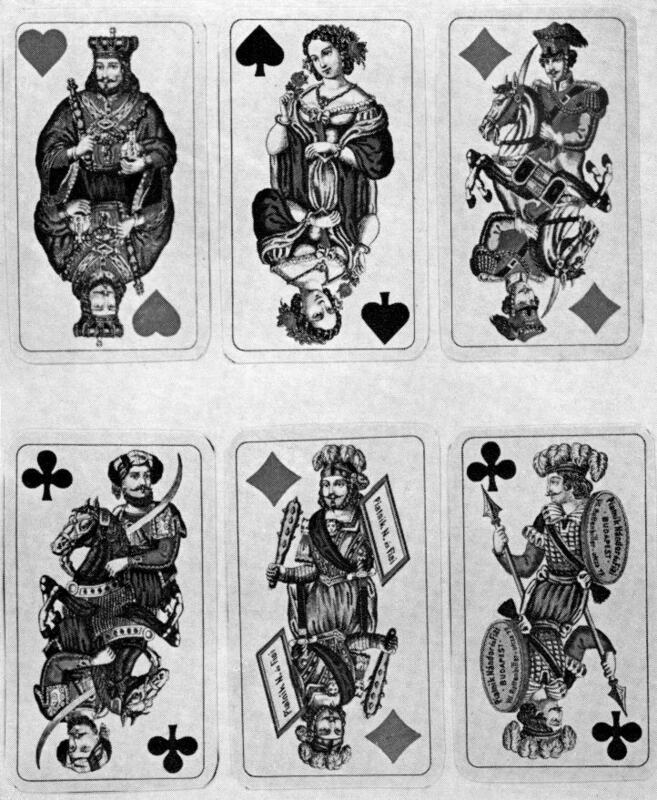 4 suits of 8 cards: king, queen, cavalier, jack; red suits ace-4, black suits 7-10, plus 21 trump cards and the Fool or Skys. 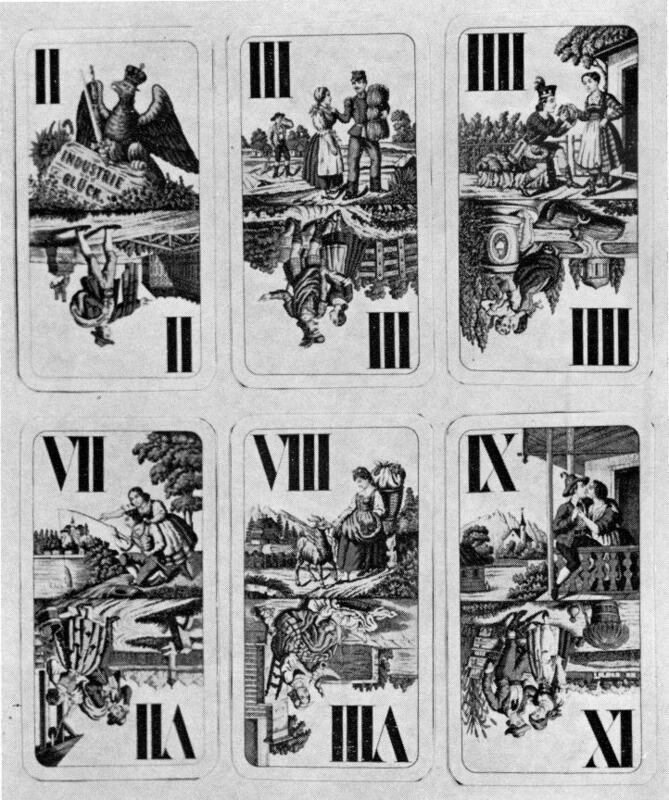 Also known in 42-card form in which the composition is as before but the red 2-4s and black 7-9s have been suppressed. Ludwig Jaeger (c.1890); Ferd. Piatnik & Söhne (this pattern c.1890- ); both of Vienna. J. Ritter a Spol (early 1920s); Piatnik Synove Ritter a Spol (between the wars); Ceská Grafická "Unie" (1920s); Obchodní Tiskárny (c.1946- ); all of Prague. Cards from a pack by Ferd. Piatnik & Söhne of Vienna.